Place the nopal in a large, deep pot and cover it with water. Add the onion, 1 teaspoon of salt, 1 tablespoon of olive oil and vinegar. Cook over medium high heat for 45 minutes or until it’s cooked and tender. Strain, remove the onion and wash the nopal several times with very cold water to keep from cooking more. Set aside. In a large bowl, combine the garlic, 1/2 teaspoon of salt, 1/4 teaspoon of pepper, the lemon juice, cilantro and 4 tablespoons of olive oil. Add the shrimp, mix together and refrigerate. Prepare the vinaigrette by blending all the ingredients together. Set aside. In a large bowl, combine the nopal, cantaloupe and honeydew balls, and mango. Add half the cilantro vinaigrette and gently mix everything together. Refrigerate this mixture and the rest of the vinaigrette until you’re ready to serve it. Set the grill to medium-high heat. Place the shrimp on the grill for 3 to 4 minutes on each side. Take the salad out of the refrigerator. 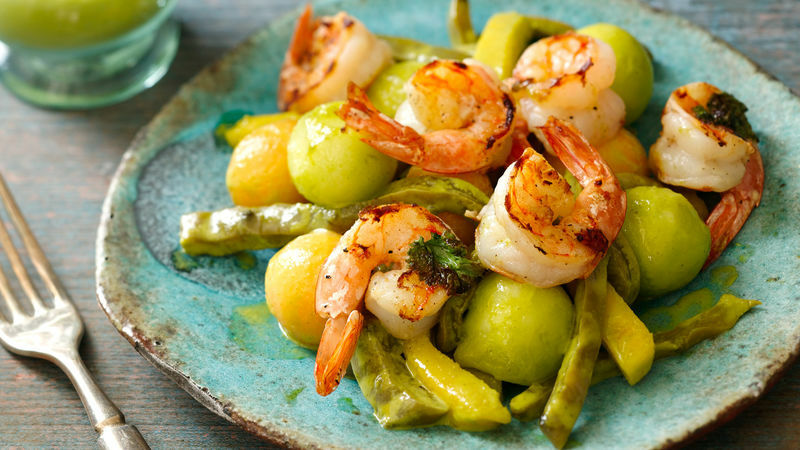 Distribute on individual plates and top with the grilled shrimp. Put the rest of the vinaigrette into a small bowl in case someone wants to have more. You can substitute grilled chicken breast strips for the shrimp. You’ll know the shrimp is done when it turns pink. Don’t overcook, or it will become tough. Blanca Arroyo Has it ever occurred to you that you could combine cantaloupe, honeydew and delicious mango with nopal and shrimp? Then you have to try this recipe; it will amaze you. And trust me: it’s so delicious that I’m sure several of your guests will want to learn how to make it. Plan a barbecue with your family this summer and amaze everyone with this salad!